Archivarius 3000 – is a full-featured application to search documents and e-mail on computer, local network and removable drives (CD, DVD and others). The program will extract and save full information about documents, which allow to search and overview documents even if these are physically not accessible. There are embedded functions for quick overview and documents printing, tools for remote searching and accessing via Internet. Archivarius 3000 [Version 3.22 from 16.07.2005]. Context search (with morphology) in English, German, French, Italian, Spanish, Portugues, Russian, Ukrainian and Belarusian. Searching documents in archives: ACE, ARC, ARJ, BH, CAB, GZIP, JAR, LHA, LZH, RAR, TAR, ZIP, ZOO. Searching documents in different encodings: DOS-866, WIN-1251, Unicode, UTF-8, KOI-8, ISO-8859-5, MAC, IBM-1125 (RUSCII). Searching in Outlook Express, Outlook, The Bat!, IBM Lotus Notes, Netscape and Mozilla e-mail messages and their attachments. Multilingual interface (English, Russian, German, Dutch, Ukrainian and much more). Archivarius 3000 is shareware program. Detailed information about this program you can read on official web-site. If you have ideas or wishes for Archivarius 3000 developers please subscribe to http://groups.yahoo.com/group/archivarius3000/. 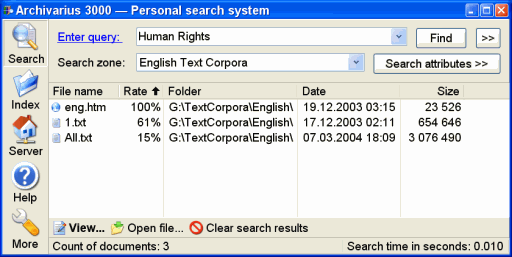 informational search system, document search, search text documents, search in office files, search in text files, search e-mail messages, intellectual search, fuzzy search, find document, desktop search.